This piece is made using satinique cord in combination with a waxed cord in solid black. The length can vary from about 16 to 19 inches with a center jeweled piece that adds 3.5 inches. The first section of the jeweled piece consists of a large red marble round topped with a fully-faceted black glass rondelle. 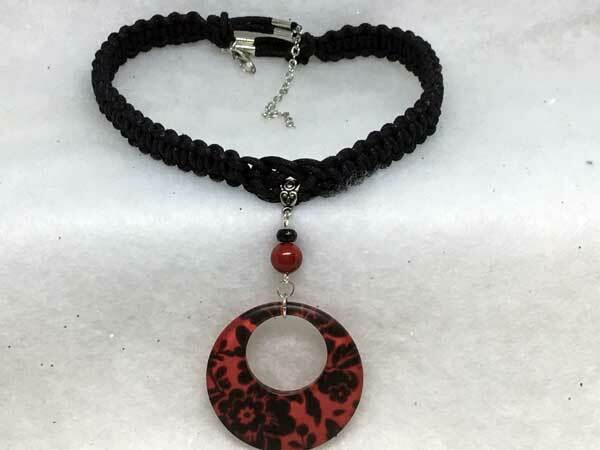 Hanging separately from this, for added movement and sparkle, is a large, flat acrylic donut in a beautiful red/coral background, with a lovely, black flowered design throughout.